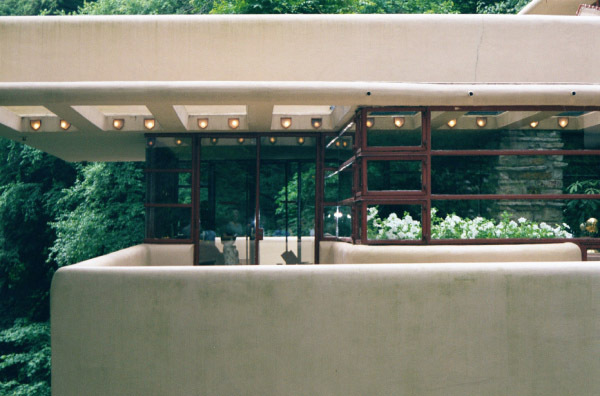 Fallingwater: Living room terraces and glass walls (from east). Beyond the glass in the photo is the living room, and through the glass doors on the left the light colored wall is actually the far wall of the southwest terrace The terrace in the foreground extends to the right beyond the photo, and another set of glass doors open out from the living room to that end of the terrace. Because of Frank Lloyd Wright's design features interpenetration of inside and outside, several aspects of this photo seem almost to be optical illusions. Already mentioned is the fact that you are looking straight across the living room to the far terrace through the glass doors on the left. The green you see above the far wall is not a reflection; you are looking straight through the house to the trees beyond. The left half of the trellis is fully outside, open to the sky above. But the right half of the trellis is integrated into a glass section of ceiling over the corner of the living room that contains the hatch and stairway down to the stream, creating both vertical and horizontal connectedness. The piece of rock wall you see on the right may appear to be a reflection of some exterior wall, but it is actually a support pillar inside the living room (next to the desk; back on the left in this black and white photo of the living room). Here the rectangular openings in the trellis run east and west; in the trellis over the driveway at the back of the house the openings run north and south. Click here or on photo for much larger (1531x1012 pixel, 315k) version. Wright created long, drawn-out lines and planes to achieve repose among daring structural exploits, and his use of trellises over the eastern terrace and driveway balances the three-story glass wall on the west. - Edgar Kaufmann, Jr., Fallingwater: A Frank Lloyd Wright Country House, p. 113.